I have not posted as much on here as in the past but I don't want to close down the blog so I will be taking a break. At some point I may come back to the blog or if some event occurs that I want to share but I don't know when. All the cats and the humans at our house are fine. I do post often on our Facebook page Cats of Wildcat Woods. and on our Instagram page, @wildcatwoods. We also have a local page called Carolina Mountains on Facebook if you want to know what the humans are up to. Please follow us at any or all of these. It has been a wonderful experience blogging and getting to meet you all. We have made some very dear friends. After nine years, it is time to focus on other things. at least for a while. Please feel free to email us at calcatsndogs AT gmail DOT com if you want to keep in touch. We would love to hear from you! Take care. We love you! On Friday March 3, it will be four years that our beloved totrtie Chica left us for the Rainbow Bridge at age 22. She is forever in our hearts. It is also Mom's birthday so this makes each birthday a bittersweet one. Let's take a moment to recall some of Chica's memorable moments on our blog thru the years. She was a very unique personality and her bond with Mom was real and true. Chica shortly after she was found. Mom found her in FL at a strip mall. She came right to Mom even tho other people were sweet talking her and trying to get her to come to them. She was about 5 months old. 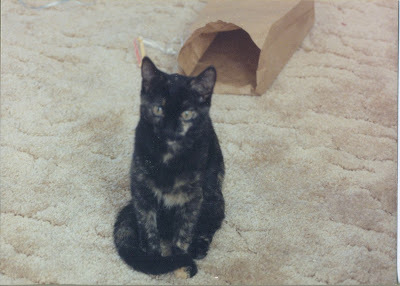 Being Mom's first cat, this was a learning experience for her.. Chica went into heat before they got her spayed. Poor Mom did not know what was going on with all the howling and schreeching. Lukcly Chica was indoor only so nohting happened. Mom had always had dogs so she treated Chica like a dog at first, playing fetch, catch and even hide and seek. Mom would say go hide and Chica would run off to her spot, usually the bath tub. Mom would call to her and look behind doors and under things until she was in the bath room. Chica would be way down in the tub so you could not see her. Mom was real quiet and waited until Chica would slowly peek over the top of hte tub to see where she was - Gotcha Mom would yell and off Chica would run while mom hid. Dad thought they were nuts.